As users adopt new technologies, some of the systems analyst’s work will be devoted to integrating traditional systems with new ones to ensure a useful context, as shown in the figure below. This section describes some of the new information technologies systems analysts will be using as people work to integrate their ecommerce applications into their traditional businesses or as they begin entirely new ebusinesses. Many of the systems discussed here can be imbued with greater functionality if they are migrated to the World Wide Web or if they are originally conceived and implemented as Web-based technologies. Increasing user awareness of the availability of a service, product, industry, person, or group. The possibility of 24-hour access for users. Improving the usefulness and usability of the interface design. Creating a system that can extend globally rather than remain local, thus reaching people in remote locations without worry of the time zone in which they are located. Systems analysts need to be aware that integrating technologies affect all types of users and systems. Many organizations envision potential benefits from the integration of many information systems existing on different management levels and within different functions. Some authors discuss integration as service-oriented architecture (SOA), which exists in layers. 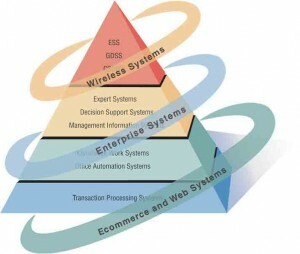 Enterprise systems would comprise the top layer. Enterprise systems, also called enterprise resource planning (ERP) systems, are designed to perform this integration. Instituting ERP requires enormous commitment and organizational change. Often systems analysts serve as consultants to ERP endeavors that use proprietary software. Popular ERP software includes that from SAP and Oracle. Some of these packages are targeted toward moving enterprises onto the Web. Typically, analysts as well as some users require vendor training, support, and maintenance to be able to properly design, install, maintain, update, and use a particular ERP package. Analysts are being asked to design a plethora of new systems and applications for adventurous users, including many for wireless and mobile devices such as the Apple iPhone, iPod, or the BlackBerry. In addition, analysts may find themselves designing standard or wireless communications networks for users that integrate voice, video, text messaging, and email into organizational intranets or industry extranets. Wireless ecommerce is referred to as mcommerce (mobile commerce). Wireless local area networks (WLANs); wireless fidelity networks, called Wi-Fi; and personal wireless networks that bring together many types of devices under the standard called Bluetooth are all systems that you may be asked to design. In more advanced settings, analysts may be called on to design intelligent agents, software that can assist users with tasks in which the software learns users’ preferences over time and then acts on those preferences. For example, in the use of pull technology, an intelligent agent would search the Web for stories of interest to the user, having observed the user’s behavior patterns with information over time, and would conduct searches on the Web without continual prompting from the user. An alternative to traditional software development in which proprietary code is hidden from the users is called open source software (OSS). With OSS, the code, or computer instructions, can be studied, shared, and modified by many users and programmers. Rules of this community include the idea that any program modifications must be shared with all the people on the project. Development of OSS has also been characterized as a philosophy rather than simply as the process of creating new software. Often those involved in OSS communities view it as a way to help societies change. Widely known open source projects include Apache for developing a Web server, the browser called Mozilla Firefox, and Linux, which is a Unix-like open source operating system. However, it would be an oversimplification to think of OSS as a monolithic movement, and it does little to reveal what type of users or user analysts are developing OSS projects and on what basis. To help us understand the open source movement, researchers have recently categorized open source communities into four community types—ad hoc, standardized, organized, and commercial—along six different dimensions—general structure, environment, goals, methods, user community, and licensing. Some researchers argue that OSS is at a crossroads and that the commercial and community OSS groups need to understand where they converge and where the potential for conflict exists. Open source development is useful for many applications running on diverse technologies, including handheld devices and communication equipment. Its use may encourage progress in creating standards for devices to communicate more easily. Widespread use of OSS may alleviate some of the severe shortages of programmers by placing programming tools in the hands of students in developing countries sooner than if they were limited to using proprietary packages, and it may lead to solving large problems through intense and extensive collaboration.